I will be at the Biennial this Shabbat with FPS folk so I wish you all a Shabbat Shalom from Solihull where we will be from Friday. Rabbi Abraham Joshua Heschel wrote in Moral Grandeur and Spiritual Audacity. "Our life is beset with difficulties yet it is never devoid of meaning." It is so true but not in the way Rabbi Heschel may have meant when he wrote this line in the 1960's seeing Jews against the world. For me it reminds that we want a life with meaning. This past weekend I was struck by so many in our community leading us to do just that. From Ollie Pelham's Bar Mitzvah where many of us gathered at FPS, thinking so much of our friend David z'l and looking forward and back. 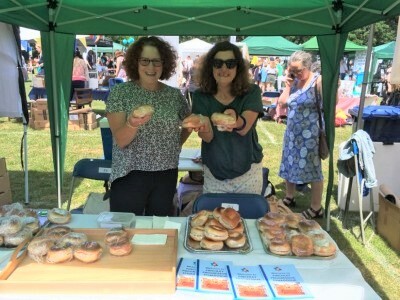 And then Phillip Raphael's team at Sunday's East Finchley Festival (photos below). One might think, it's a pretty thankless task to make and sell 250 smoked salmon bagels ... but it wasn't. We had a stall proclaiming us as a community, FPS members volunteering with Phillip all of whom, by all accounts, had a great day in the boiling Finchley sunshine. Leaders of our community represented us and modelled such community spirit.! At the other end of town, I was conducting a wedding blessing for new FPS members and then joined Ofra Rosenwasser and Lesley Urbach at a tea hosted by our Syrian friends who have joined and brought so much to our refugee project. We have made such significant friendships across so many bridges. Then I returned home Sunday evening to find this email from a member and leader at FPS. I've realised, in my advancing years, the importance of contributing to my Jewish community, and so, to my own Jewish identity. Be inspired. Come to the AGM on 10 July. Be in touch. I will happily come to you for a cup of tea for conversations about bringing that meaning we all want.